Cazino Cosmos slot may give you an indication as to what to expect by the spelling 'Cazino' as this is similar to Yggdrasil's high-volatility classic Cazino Zeppelin, itself based on Netent's Dead or Alive. The music has the same dramatic and classical base as before, with the reels set over an old fashioned time machine and moonlit sky, plus we see the same mix of characters and card suits for the symbols. There have been some significant changes in the Cosmos though, so can these have an out of this world effect on our bankroll? As before with Cazino Zeppelin we get the same 20 pay lines over 5 reels of 3 rows each on Cazino Cosmos slot, with single symbols and Wilds on all of them. The pays are quite high in keeping with the high potential of this mechanic and the Count is top, along with the Wilds at 100x bet for 5-of-a-kind. The Bird Man awards 50x, Mouse Man 37.5x, Robot Man 25x with 4 card suits at 8.5, 7.5, 5 and 4x bet. There are Gold Coin scatters on all reels but the big change in this game comes with the addition of an alternative and rarely-seen Wild character which is different on each of the 5 reels and makes Cazino Cosmos very interesting and potentially rewarding. We will begin with the standard free games which are the same as the Zeppelin ones. 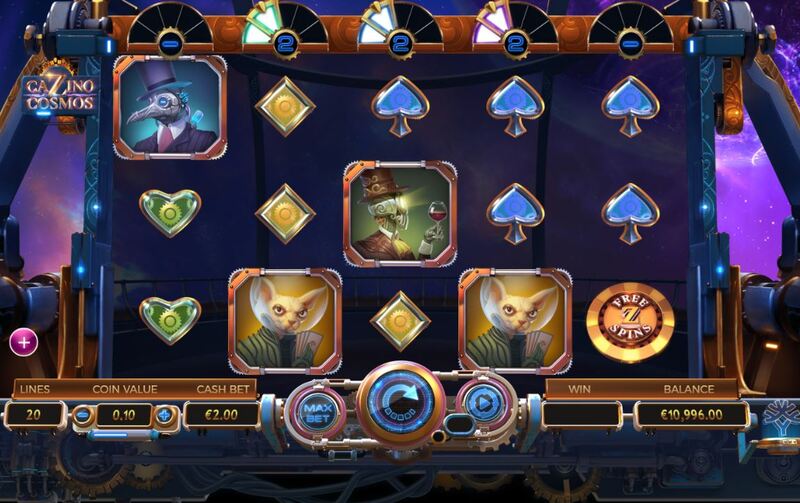 If you see 3, 4 or 5 scatters anywhere in view you will be rewarded with 10, 15 or 20 free spins respectively. Earlier I mentioned Dead or Alive slot and this feature is the same as that game's with the exception that any Wilds appearing on the reels when you trigger the spins here get your sticky Wild collection off to a head start. You will then see any further Wilds become sticky for the duration and if you get a Wild on all 5 reels you get 5 extra spins. If this happens you'll almost certainly be looking a final total of anything from 500 to several thousand times bet! 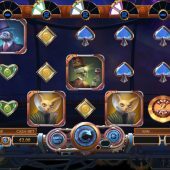 Reel 1 - Card Shot spins: same as standard free spins but with 2 randomly plced stciky Wilds added before they begin. Reel 2 - Hack spins: you get 5 extra spins so begin with 15. Reel 3 - Zero Gravity spins: if a Wild lands either one row above or below the reels it will nudge up or down in this bonus before becoming sticky. Reel 4 - Mutation spins: on each spin one of the top 4 picture symbols is chosen and any on the grid after the spin may become extra sticky Wilds. Reel 5 - Expansion spins: all Wilds now appear on the reels double-stacked. Doesn't include those already on reels at trigger, if applicable.